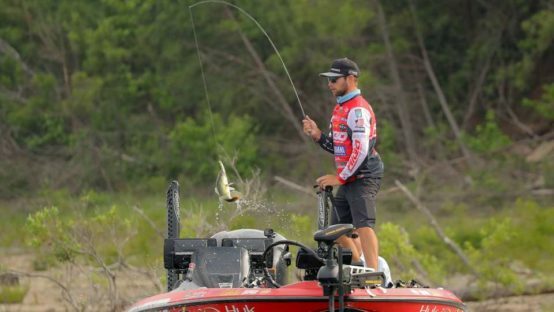 Brandon Palaniuk covered Sam Rayburn Reservoir from “three foot to 30 foot” with three baits to win his third Bassmaster Elite Series tournament, weighing four 5-fish limits for a combined weight of 93 pounds, 12 ounces. Edging out the runner-up by 2 pounds, the Idaho pro caught all his fish on a Storm® Arashi™ Top Walker lure and two bait rigs armed and anchored with VMC® hooks and weights. And although he conceded it “sounds crazy,” Palaniuk caught all his biggest fish on the smallest thing he offered them – a Neko Rig comprising a 1/0 VMC Weedless Neko Hook, a 3/16th oz. Half Moon Wacky Weight and a 5-inch finesse worm. VMC’s Half Moon Wacky Weight is mushroom-shaped and features a long, ribbed shank designed to embed in – and stay put in – one end of a soft-plastic worm. The Weedless Neko Hook is a new VMC finesse offering that won’t be for sale until after July, when it will be officially unveiled at ICAST, the sport-fishing industry’s largest tradeshow. Weedless Neko Hooks feature a black-nickel finish, a wide gap, 3-degree offset point, a resin-closed eye and a forged, long shank. They’re available in four sizes: 2, 1, 1/0 and 2/0. What makes them weedless is a unique snag-guard made from two heavy-duty fluorocarbon bristles. Unlike wire, the 50-pound-test fluorocarbon bristles guarding a Weedless Neko Hook are practically invisible to fish. They also protect the hook from the kind of submerged trees and brush that Palaniuk was fishing on Sam Rayburn. Palaniuk’s third “key” bait was a Storm Arashi Top Walker, a topwater lure that walks-the-dog with ease. “Every single day I caught a big one on it,” he said. Although Neko Rigs are productive year-round, most anglers favor them in the post-spawn and summer. 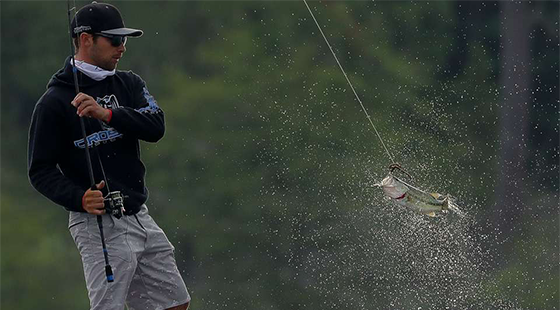 “It really shines once the fish get offshore a little bit and grouped up,” says fellow VMC pro Seth Feider, who used Neko Hooks to win a Bassmaster tournament last year. In his Sam Rayburn win, Palaniuk threw Neko Rigs on a 7-foot, medium-action spinning rod spooled with 10-pound-test line. Light line is key to allowing the rig the best fish-attracting action. Built tough for worry-free use around heavy cover, VMC’s Heavy Duty Wide Gap hook features an offset behind the eye that arches away from – and then back toward – the hook bend, making it ideal for larger softbaits. A three-degree twist in the hook body provides instant and hassle-free hooksets. “Without that fish at 2:36, there’d be a different dude standing up here right now,” he said. And that wasn’t just hyperbole – the tournament runner-up caught a 6-pound bass at 2:30 p.m. to take an unofficial lead. Palaniuk’s 2:36 p.m. catch gave him a 2-pound margin of victory. Storm’s Arashi Top Walker strides true even when retrieved fast, having been purpose-built to eliminate the missed opportunities all too common with lesser topwater options. A long-glide walk-the-dog action, a powerful wake and a multi-ball cadence rattle combine to make the Top Walker a seductive little siren sure to call in the biggest bass from the farthest distance. It’s available in both a 4 ½-inch and 5 1/8-inch size. Top Walkers feature four bearings that broadcast a variable pitch frequency, mimicking the sound of schooling baitfish that predators can’t ignore. Rotated hook hangers, a feature of all baits in the Arashi lineup, ensure that all of the Top Walker’s three sticky-sharp trebles will grab fish and not let go. This entry was posted in Rapala and tagged Arashi Top Walker, Brandon Palaniuk, Half Moon Wacky Weight, Heavy Duty Wide Gap hook, Storm, VMC, Weedless Neko Hook. Bookmark the permalink.